An FM gave me good advice once - when looking for tactical shots, imagine that you have "super-pieces" that can jump to any square immediately (just for this next move). 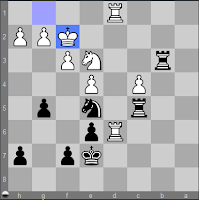 For example, in the first diagram, super-rook to a2 is mate. Once you've identified those possibilities, then you can look for ways to make them happen (over the course of multiple moves), often by means of intermediate forcing moves. Super-pieces and threats against squares -- that makes sense. I'm not sure I understand the second puzzle, though. I would have played 1. ... Rxe3 2. Kxe3 Nxf4+ 3. Ke2 Nxd6. What's that got to do with "finding the initial square" for the knight fork? Or am I missing something? Your solution is the only correct solutionm Chunky. I too dont understand what our blog writer means with 'finding the initial square' Heck, what is an initial square? A case of mistaken example but the right idea. In this case, i needed to find the first move before the fork. In which case, there is no fork at the beginning. You needed to set it up. About finding the initial square. lets say for example the knight at f3 would first have to go to g5 before forking the d8queen and the f8rook by coming to e6. The knight needed two hops to go to the forking square instead of a one-fork move. So what I was saying was, if there is an initial move to be done before the fork.. it is hard for me to see.